Life under the waves is pretty great. The creatures are gorgeous, the water is warm. The only problem is, the shopping isn't very good. It's pretty hard to find a strip mall and you can't even order anything online. It's a small price to pay to live free and easy in the deep blue sea. You can always look for the cutest accessories on the ocean floor. Finding a piece of coral to put in your hair can be very pretty. The sea weed doesn't work quite as well, it gets a little slimy. 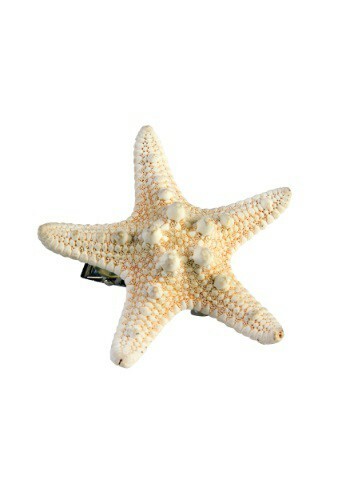 The most coveted hairpiece a mermaid could find is a beautiful starfish. Luckily for you, since you're on land, you can simply order this clip instead of searching the ocean floor. This will be the perfect detail for your mermaid costume. Great wavy hair is one of the most important parts of any sea siren's ensemble. Put this in your beachy waves to make your costume complete.